Frederick Verner’s depictions of early Canada tell us much about the lives of Canada’s First Peoples - recording details of their villages, clothing, how they hunted and trapped, and other aspects of their customs. Verner was born in what was then called Upper Canada - now Sheridan, Ontario - and as a child was fascinated by the art of Paul Kane. Kane’s depictions of First Nations people were well known, and Verner tried to convince the more seasoned artist to take him on as a pupil. Kane declined, although the two would become friends later in life. Verner pursued his own art education, traveling to London to study at Heatherley’s Academy. Upon his return to Canada in 1862, he worked as a photographic colourist and then a photographer, but still aspired to follow Kane’s path. His opportunity to do so came when he was invited to join Manitoba Chief Justice Alexander Morris at the signing of the North-West Angle Treaty at Lake of the Woods in 1873 (Treaty No. 3). While there, Verner filled sketchbooks with drawings, and many of these became the source material for his later canvases. He sought authenticity in his work, and while his paintings might appear less detailed than Kane’s, this is due in part to the fact that he was less inclined to embellishment. 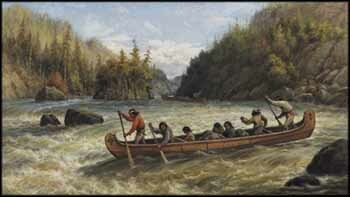 Here we see two canoeing parties negotiating the rapids of a wide river, their boats sitting very high in the water. Perhaps they are heading out on a hunting trip or venturing to a trading post - as they are so lightly loaded, we cannot be sure. Verner has painted the rapids as a rush of golden, frothy water, and depicts the paddlers standing high in the canoes in order to negotiate the rocks. All the figures in the first boat look into the water, and they are completely focused on the task at hand. Around them, the forest shows the first signs of fall, as a tree here and there is lit like an orange flame by the change of season. The forest is dressed for autumn, and Verner picks up and repeats these fall colours in the clothing the figures are wearing - the shirt of the bow paddler in the first canoe, the stern paddler in the second, and the sashes and scarves of other individuals - as well as in the markings on the gunwale of the canoe nearest to us. The sky is filled with softly coloured clouds, which in their brushwork echo the treatment of the water. The birchbark canoe is an example of one of the most ingenious and important inventions of the First Nations people of Canada. These vessels were essential in the exploration of early Canada - they supported the fur trade and underpinned the success of intercontinental trade. The Algonquin peoples were expert paddlers and master canoe builders, building their canoes in the spring, when tree sap was running and the wood was pliable. Bark was peeled from select birch trees in large sheets and immersed in water to keep it soft, while the ribs and gunwales were made from black spruce (or cedar in western Canada) and the thwarts from hardwood trees. Resin from boiled spruce or pine sap was softened with animal fat and used as a sealant; spruce roots were split into long strands and soaked to make them pliable enough to sew the bark over the hull. Beautiful designs were often painted onto the bow and stern, and patterns along the gunwales were also common. They were very fine boats indeed. Verner is one of a mere handful of artists who depicted early Canada, and in this rare work, we have a masterful rendering of a bygone time.